We pay special attention and give priority to dealer orders. We understand the need to fill your customers' orders as quickly as possible. We will do everything possible to ship your orders within 24 hours of receipt. Our products are guaranteed to meet or exceed OEM specifications in fit, look and quality. If you are unhappy with any of our products, simply return them within 30 days in resalable condition for a complete credit, refund or exchange. El Camino Manufacturing assumes no responsibility for improperly installed merchandise or misuse resulting in damage to the part. All prices and availability are subject to change without notice. We will make every attempt to ensure availability of our products, however, due to various problems that occur with manufacturing, El Camino Manufacturing neither implies or guarantees availability. All orders are shipped F.O.B. Port Angeles, WA. All orders will be shipped UPS unless otherwise specified. El Camino Manufacturing will ship dealer orders COD (company check accepted) upon approval of a credit application. Customers not meeting the requirements for check approval must pay COD (certified check, cashier's check or money order) upon delivery. Dealers may also use major credit cards. 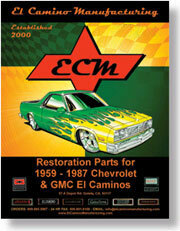 El Camino Manufacturing must be notified within 48 hours of delivery. We will not be responsible for shortages or damages after this period. Be sure to thoroughly check the box(es) for all items before submitting a shortage claim. Some products may be inserted in odd areas of the box for protection and are not readily visible. Returns will be accepted for up to 30 days from the date of the invoice. Returns must be authorized in advance by calling our customer service department during regular business hours. Dealers will be charged a 20% restocking fee for refused, undeliverable or unauthorized returns. In addition, El Camino Manufacturing may require prepayment of all future orders.